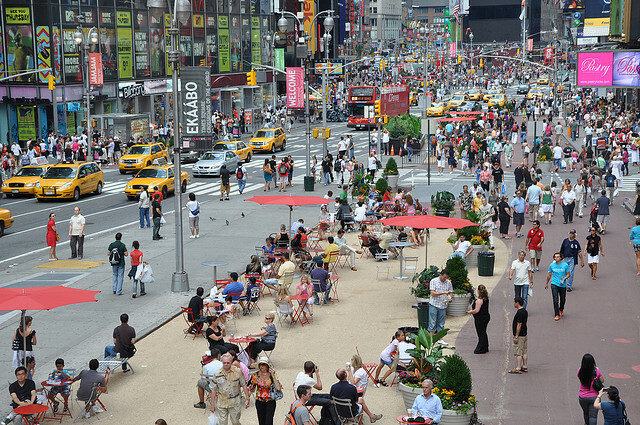 What are the key ingredients for creating streets that function as quality public places that draw people in? Below is our list of 8 principles for fostering Streets as Places, based on our years of experience in working with communities, the observations and research of well-known placemakers like Jane Jacobs and Allan B. Jacobs, and recent conversations with folks like Victor Dover, Ben Hamilton-Baillie, and Gil Peñalosa. Streets as Places is about Placemaking on one of the most important public spaces each community has - our streets. 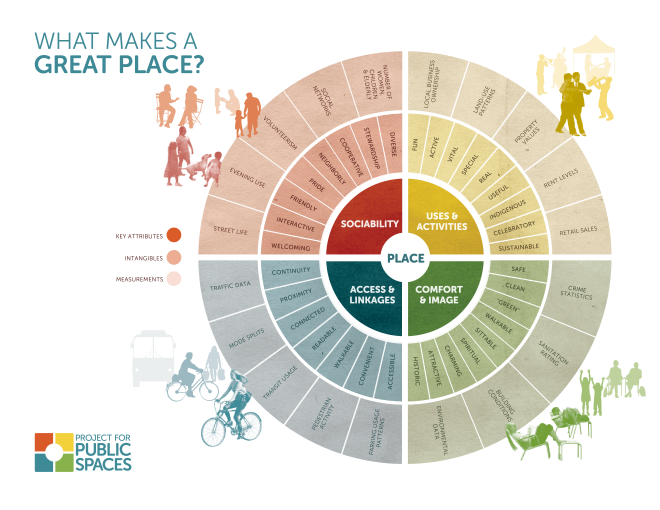 Strengthening the connection between people and the places they share, Placemaking refers to a collaborative process by which we can shape our public realm in order to maximize shared value. With community-based participation at its center, an effective Streets as Places process capitalizes on a local community’s assets, inspiration, and potential, and results in streets that contribute to people’s health, happiness, and well being. Help us add other examples to this page! Add your suggestions about other great streets, important strategies for fostering Streets as Places, or ways that individuals, communities, and governments and groups can support these concepts in the comments section, or by emailing transportation@pps.org. "We go back to some streets more often than others… Maybe a street unlocks memories, or offers expectations of something pleasant to be seen, or the possibility of meeting someone old, or someone new... Because some streets are more pleasant than others, we go out of our way to be on them." - Allan B. Jacobs, "Streets: Old Paradigm, New Investment"
People need to have a reason to be, and stay, in a particular place. The more activities and options a street offers, the more it attracts diverse groups of people - which is essential for creating a place that feels vibrant and dynamic. That’s the idea behind the Power of 10 concept - that great places tend to have at least 10 things to do in them, or some critical mass that attracts people and starts to create a buzz of activity. But it’s not enough to just have a great set of restaurants and shops and businesses that operate behind closed doors. Great streets have an "inside-outside" quality where indoor activity spills onto the street - whether that’s through sidewalk displays of merchandise, outdoor cafés, or special events or programming that take place in the right-of-way. Christopher Alexander, in his seminal book A Pattern Language, explains the importance of how a building interacts with the street: "The building with a lively building edge is connected, part of the social fabric, part of the town, part of the lives of all people who live and move around it...If the edge fails, then the space never becomes lively." Gil Peñalosa refers to sidewalks as "family members of parks," meaning that anything that happens in a park could also happen on a sidewalk - or potentially anywhere on the street, for that matter - from socializing, exercising and play, to dancing relaxation and civic activity. If more institutions, such as government agencies and businesses thought about the street as a key part of their facility (as many libraries and restaurants do), imagine the creative things that could happen there! 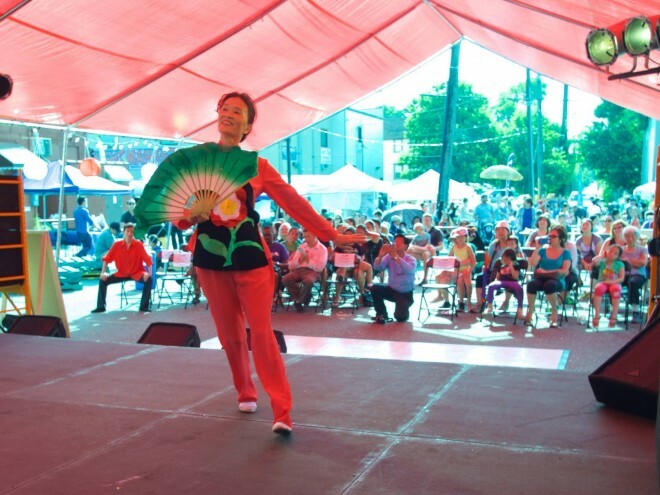 When paired with liberal policies on street vending, performances, and other activity, streets have the potential to be the most diverse and exciting places in our communities. 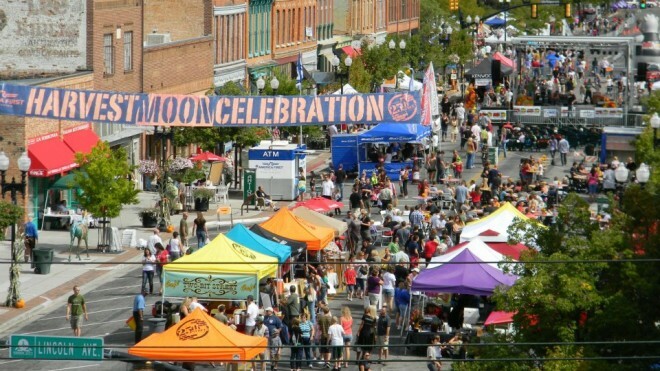 Three blocks long, 25th Street in downtown Ogden draws large crowds with its outdoor dining cafés, restaurants, bars, merchant displays, amphitheater, and year-round events. This street’s popular weekly and annual events include bicycle races, yoga, art crawls, live theater and music, movie nights, a farmers market, and a Christmas Village. 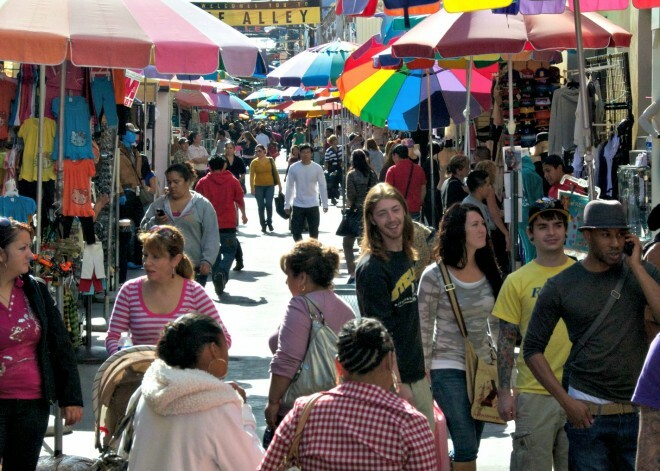 At nearly 20 feet wide, Santee Alley supports more than 150 merchants, and it offers some of the best deals on clothing and accessories in Los Angeles. In the 1970s, wholesalers in LA’s Fashion District began selling their surplus merchandise outside on weekends in what is now known as Santee Alley. Today, the three-block long Santee Alley has become a popular shopping mecca and a favorite destination for both locals and tourists. One of the oldest and longest pedestrian streets in Europe, Strøget is home to a variety of great destinations that draw thousands of pedestrians to this street everyday. 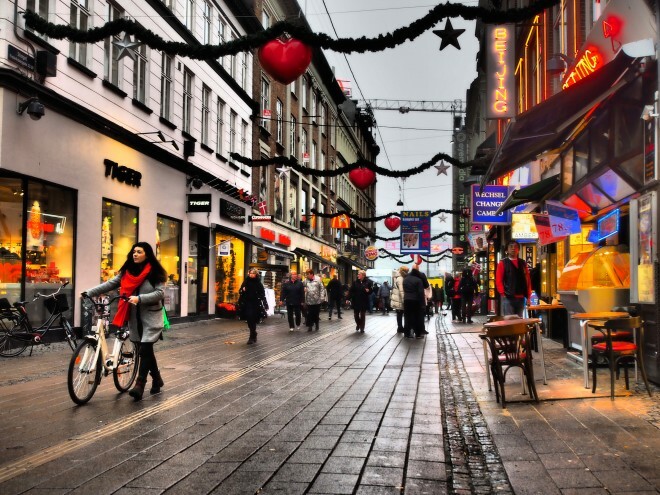 In addition to being a popular shopping destination, Strøget serves as a gathering space for locals and a great street for walking to reach City Hall or Kongens Nytorv Square. In the winter, a Christmas Market takes place next to this street’s landmark Stork Fountain. Filled with fountains, public art, street entertainers, vendors, shops, restaurants, and events, this historic pedestrian mall offers something for everybody. 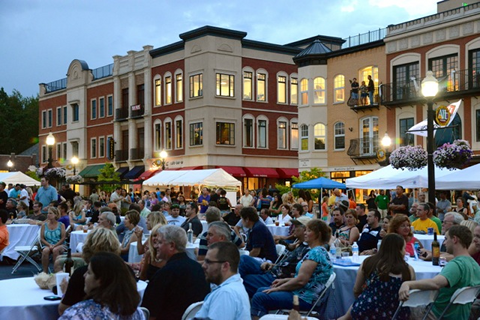 Programming on Church Street Marketplace occur year round, with events including farmers markets, dance festivals, lighting celebrations, and winter markets. Located adjacent to the French Quarter, Frenchmen Street is where locals go to enjoy some of New Orleans’ most famous music venues, to devour local flavors, and to shop for local art. Five days a week, an outdoor market, the Frenchmen Street Art Market invites visitors to linger and enjoy the energetic ambiance of this colorful two block-long street. 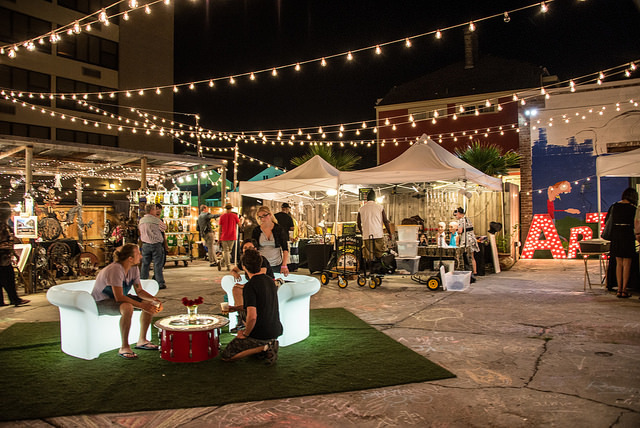 The market, located in an alley off of Frenchmen Street, features local artists showcasing their art, crafts, and jewelry, and it is well known for its fun outdoor living rooms. 8th Street has diverse shopping and dining options, several arts venues, and year round festivities. In winter, the street’s sidewalks are heated to provide a snow free experience, and there is an outdoor fireplace to keeps visitors warm. 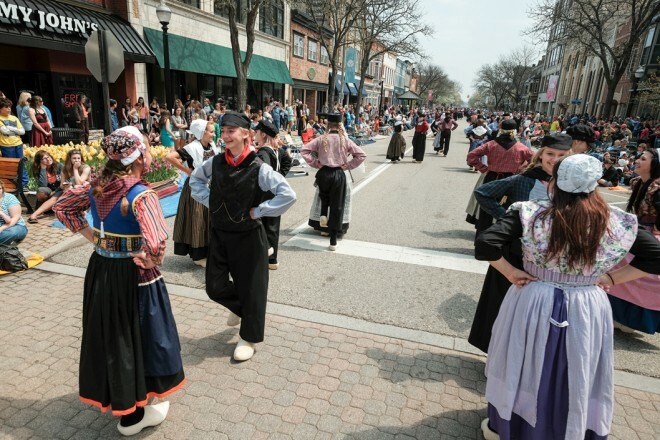 Unique programming - including popular winter events such as the Dutch Winterfest, Holiday Kerstmarkt, and Sinterklass Eve - draw year-round crowds to this lively street. This historic avenue is filled with beauty and architectural charm, as well as many unique independent shops with interesting window displays that attract residents and tourists alike. 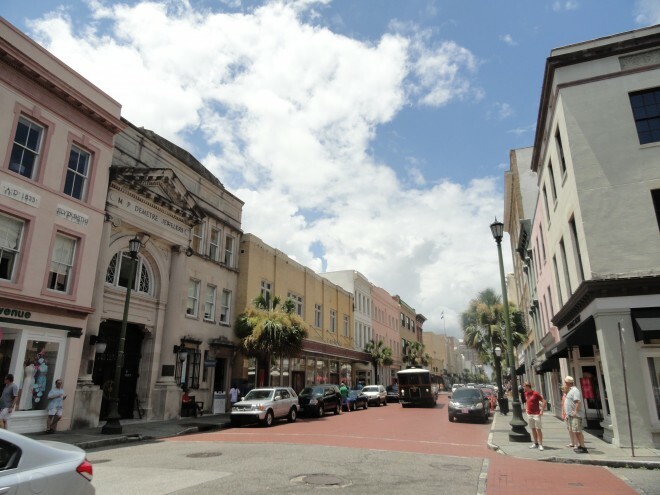 The street is split into three nodes: the Design District, the Fashion District, and the Antique District. With colorful buildings and a mix of residential and commercial land uses adjacent to a beautiful waterfront view, Nyhaven is one of the liveliest places in Copenhagen, even in the winter. During colder months, the restaurants and cafés lining this street provide blankets and gas lamps to allow for outdoor seating. 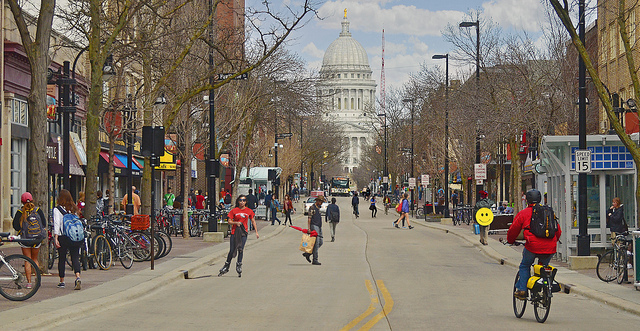 Connecting the University of Wisconsin campus and the Wisconsin State Capitol, State Street is the heart of the Madison community. With a year round farmers market, street fairs, holiday trolley, dozens of shops, restaurants, and bars, this street is vibrant and busy at all times of the day, week, and year. 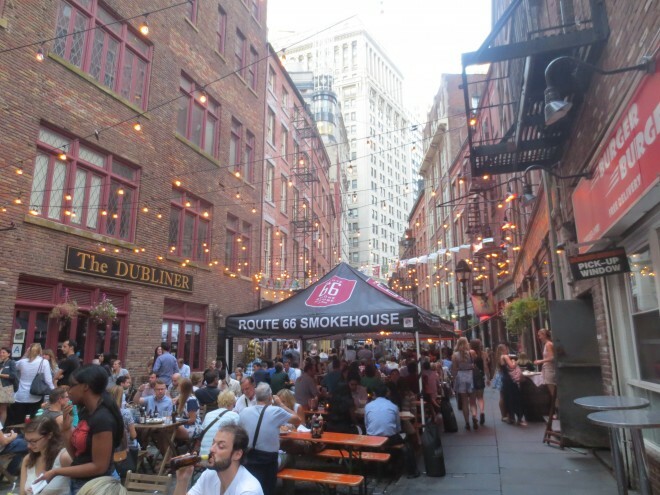 Home to several restaurants, bars, and plentiful outdoor seating, Stone Street is the outdoor destination for the Financial District. Tables spill out into the street, making it one of few places in Manhattan that permit drinking on the streets. This cobblestone oasis evokes the atmosphere of an outdoor beer garden, making visitors forget that they’re actually in the center of the financial world. Offering barrier-free bicycling and walking for those making cross-town trips, the Midtown Greenway is a 5.5 mile bicycling and walking trail located in what was once an underutilized space on a former railroad corridor. 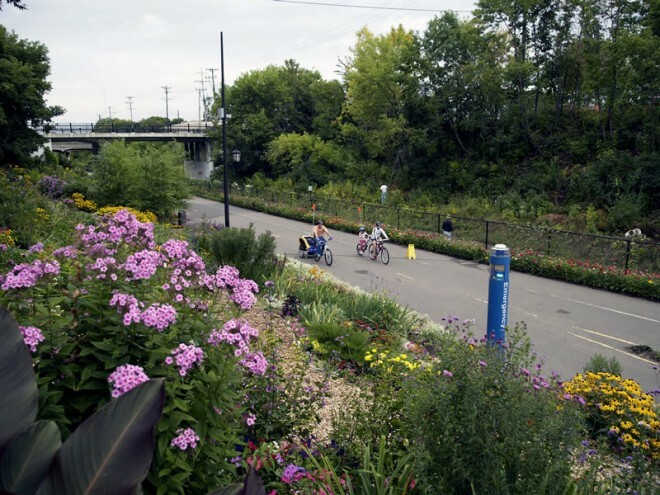 Including several community gardens, pocket parks, seating, public art, murals, wayfinding, and year round events, the Midtown Greenway is more than just a bicycling and walking path; it is a space for relaxing in gardens, viewing art, and participating in community events. Beneath the elevated Metro North railway tracks between 111th Street and 116th Street lies an important site of commercial and social activity for the El Barrio community of East Harlem. Here, La Marqueta Market, a traditional marketplace, and Vendy Plaza, an outdoor market, create a lively environment in an otherwise drab space. With local food vendors, live music, kitchen demonstrations, and a beer garden, this space underneath an elevated railway is a huge asset to the community and important symbol for the neighborhood. No one wants to spend time in a place that is unsafe. Speeding cars pose the biggest threat on many of our streets, but crime - real or perceived - can also keep a street from teeming with life. Who wants to have a cup of coffee or chat leisurely with a friend on a street where cars are whizzing by at 50 miles per hour, or where one feels at risk of being mugged? A landmark study by Donald Appleyard in the late 1960's found that people who live on streets with more car traffic have fewer social connections than those who live on streets with lower traffic volumes. And with 32,000 people who are killed and 2.3 million who are injured on U.S. streets every year, people’s concerns about street safety are more than justified. Fortunately, there is a growing body of research around how to design safe streets from a traffic perspective, and there is mounting evidence of the success of these strategies. Since vehicle speed is the number one factor contributing to the higher likelihood of deaths and serious injuries in car crashes, slow streets are not only a way to foster places that are more comfortable for people, they are also a way to make places safer. And because so many crashes occur at intersections, ensuring safe crossings is critical, too. On the crime front, Jane Jacobs was among the first, in the 1960s, to herald the importance of "eyes on the street" in making neighborhoods safer. When more people are spending time on a street - chatting on a stoop, having dinner in an outdoor café, or gardening in a front yard - there are more people to witness a potential crime, which therefore makes them less likely to occur in the first place. Streets that encourage activity and pedestrian traffic at various times of the day and week - going back to the first Streets as Places principle - naturally have more regular eyes on the street. "The safety of a street works best... Most casually, and with least frequent taint of hostility… precisely when people are using and most enjoying the streets voluntarily. 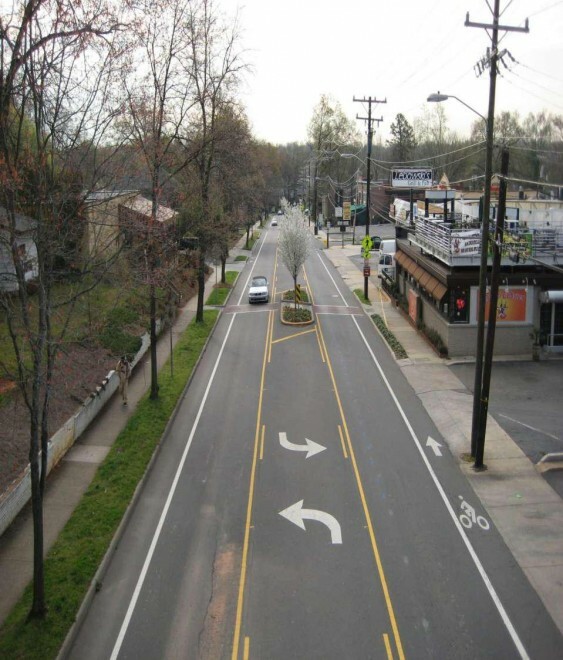 Beginning in 2006, Charlotte's East Boulevard - an arterial street with approximately 16,000 to 21,400 daily motorized vehicle traffic - began a process of rightsizing in order to reduce high travel speeds and make the area more pedestrian friendly. The street was converted from 5 vehicle lanes to 3, which made it possible to create additional bicycle and pedestrian space, including adding 12 mid-block pedestrian refuge islands and bike lanes. After the redesign, 85% of vehicle speeds declined from 43 to 40 miles per hour. Prior to the changes, some vehicles traveled at excessive speeds of 50-60 miles per hour on this 35 mile per hour road. In 2014, Mexico City’s Avenue 16 de Septiembre was redesigned to make pedestrians a priority. Traffic calming techniques, such as lowering the speed limit, putting the sidewalk and road at grade, widening sidewalks, and adding bollards, helped to improve road safety, promote the equitable sharing of space, and spur economic development. This pedestrian-priority design creates greater security, mobility, and accessibility for city residents of all ages. 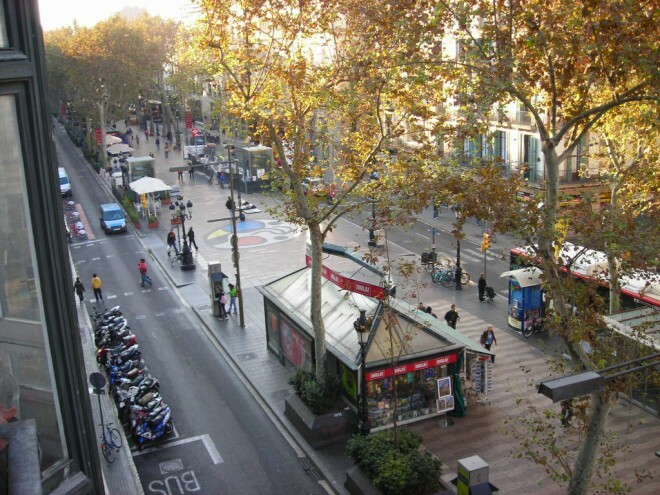 Barcelona’s most famous street, Las Ramblas, has a 60-foot wide median that is used as a pedestrian promenade, which provides a safe space for the large number of walkers, people watchers, markets, shops, and eateries along this popular boulevard. In addition to its separation from vehicular traffic, the promenade's mixed uses that encourage activity at different times of the day, as well as its pedestrian-scaled lighting, help to create a safe environment for all. 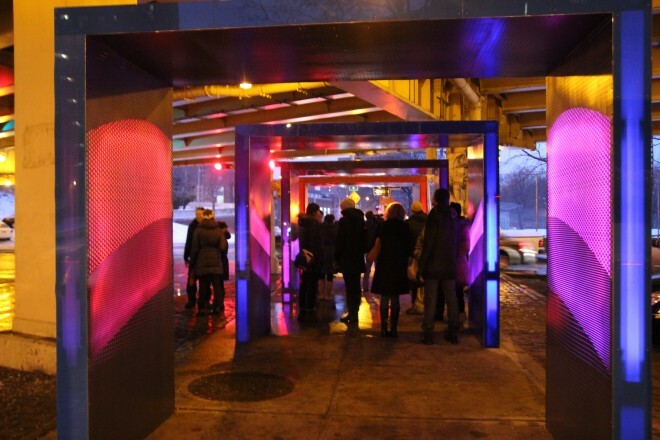 Silent Lights is an urban art installation that uses lights to frame a pedestrian pathway at Park Ave & Navy Street, under the Brooklyn Queens Expressway. The pathway's gates are embedded with 2,400 LED lights, while sound equipment registers noise from the street and transforms it into interesting light patterns. This project has transformed an overlooked walkway into an inviting, playful, and creative space. 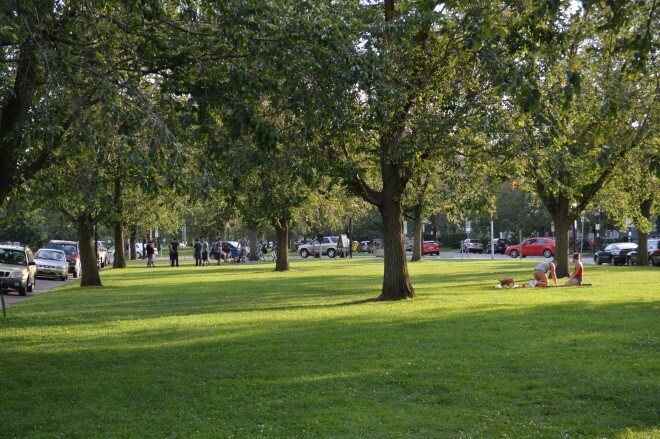 Elmwood Village’s gorgeous tree-lined grass medians function not only as a traffic calming tool, but they also add important public space to the neighborhood. The median reduces the amount of pavement space that is available to cars, while the trees lining the roadway also help to slow vehicle speeds. In occupying these medians, residents turn them into public spaces for picnicking, playing hacky sack, and relaxing. 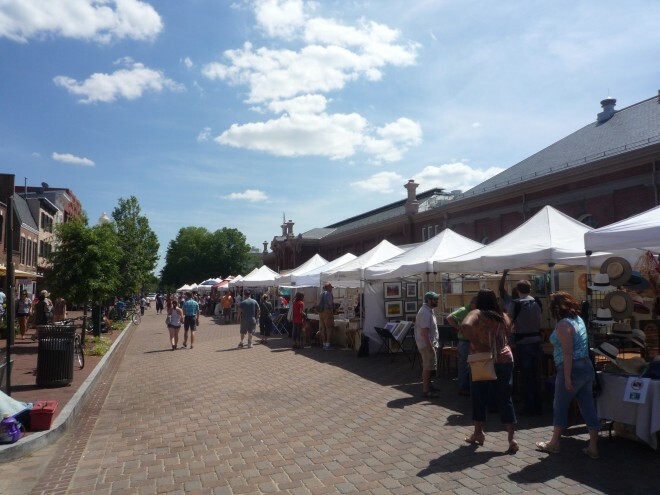 On weekends, the medians are packed with people who have come to enjoy the Elmwood Bidwell Farmers Market as well as live entertainment and events. Designed as a "shared street" to maximize space for pedestrians in a narrow right-of-way, Wall Street is home to several businesses, coffee shops, and restaurants. Though there are sidewalks, many people spill out to walk into the street, since the sidewalk and street are at grade level (which also helps to slow driving speeds). 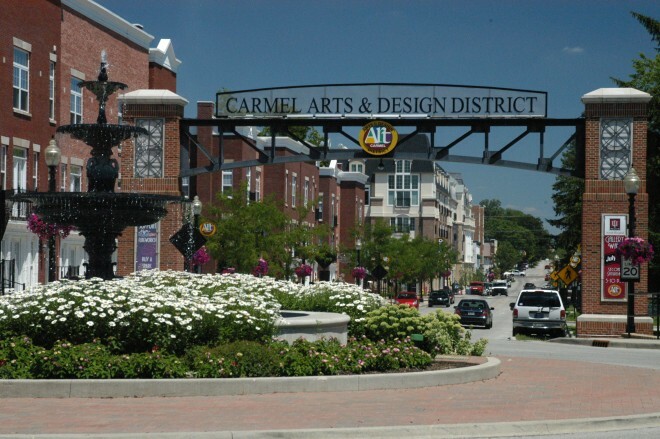 Carmel is home to more than 90 roundabouts, more than any other city in the United States. In the 1990s, the City began replacing signalized intersections with interestingly landscaped roundabouts in an effort to make Carmel a safer city for both drivers and pedestrians. Today, the number of traffic injuries on the city’s streets has been reduced by about 80 percent and the number of crashes overall by about 40 percent. The rightsizing of Prospect Park West has resulted in a much safer and pedestrian friendly environment. Prospect Park West runs along Brooklyn's premier green space, Prospect Park. On its southern end, it also serves as the main street of the Windsor Terrace neighborhood, with local commercial uses and cafés. Wide brick sidewalks, short block lengths, and slow automobile traffic make it a great place for walking. 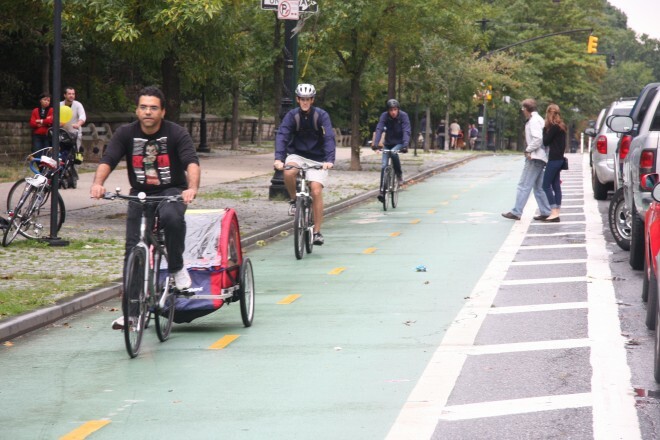 Recently, parking protected bike lanes in the section of the street that runs adjacent to Prospect Park have improved traffic safety and made it safer to access the park by active transportation. Despite being a top tourist destination, narrow sidewalks and vehicular congestion previously made Broadway an unpleasant or unsafe place to be. In 2009, 2.3 miles of Broadway Avenue were redesigned, which included removing traffic lanes, limiting turns, widening sidewalks, and adding separated bike lanes, pedestrian plazas and promenades. 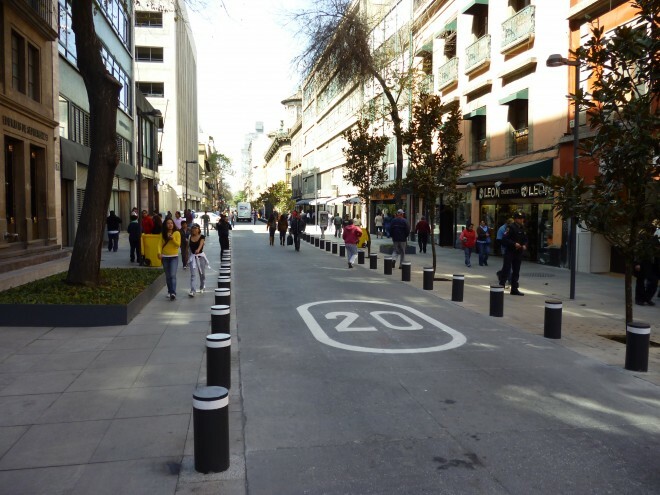 The result is a street with improved traffic flows and a safer and more welcoming experience for pedestrians. Great streets are the result of thousands of tiny details that involve the design of their buildings, landscaping, sidewalk features, and street layout itself. A walk on a beautiful street feels like strolling; a walk on a terrible street feels like trudging. Historically, the small scale of our streets and the buildings along them - with many different shops and houses occurring one after the other on small blocks - is what made our streets dynamic and diverse. There’s only so much diversity of activity and design that can occur when there are two or three mega-buildings per block. People are inherently attracted to places that offer rich detail and interesting features, among them the ability to peer into buildings’ activities. 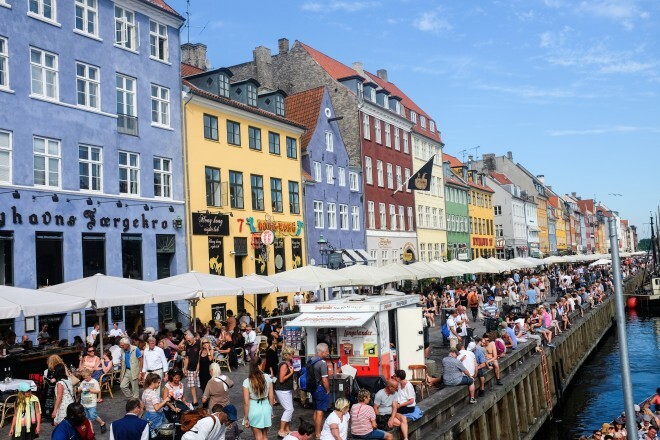 Street studies of pedestrians in Copenhagen found that activity levels were much greater in front of open building facades than those with closed off facades. As Victor Dover, one of the authors of Street Design: The Secret to Great Cities and Towns, has said: "Great streets feel like a public, outdoor room." Buildings help shape the edges of a street’s room, but architectural details, art, landscaping, signage, and of course, people, among other things, make a street feel interesting and captivate the eye. 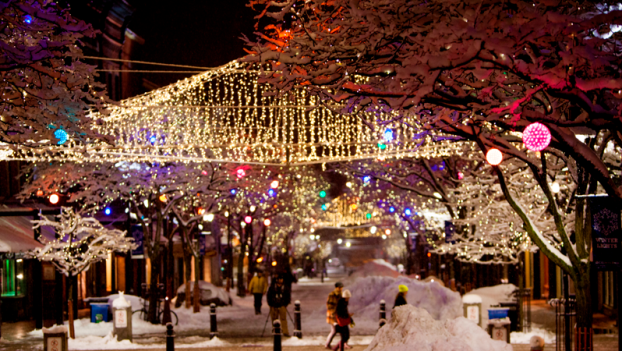 The lights and banners draped between both sides of Larimer Street in Denver, Colorado, create an inviting and festive feel on this street at all times of the year. This block-long alley in San Francisco’s Mission District is known for its high concentration of murals. Artists from the Clarion Alley Murals Project have turned a drab alley into their message board, with murals that often offer both aesthetic appeal and social commentary. Today, this alley is a place where tourists and local street art enthusiasts can go to find intricate and powerful art. 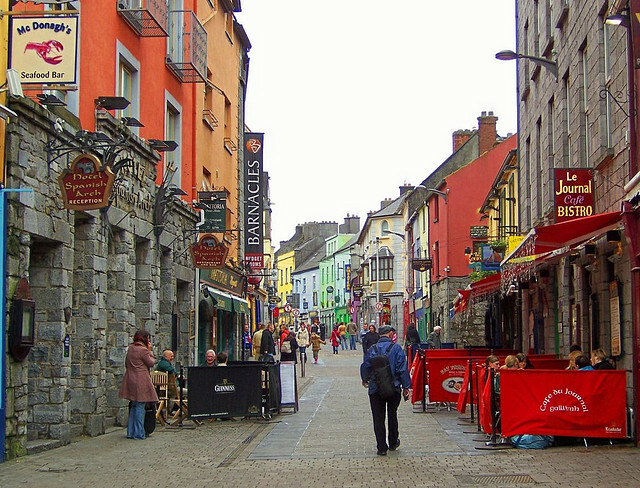 Quay street is home to many of Galway's cafés, restaurants, and pubs. The human-scaled signage and open storefronts invite both locals and tourists to take a stroll down this street and possibly stay for a chat or a bite to eat. This picturesque Parisian Street, located on I’Île de Saint-Louis, is a great place to wander and take in the lovely sights of Parisian life. 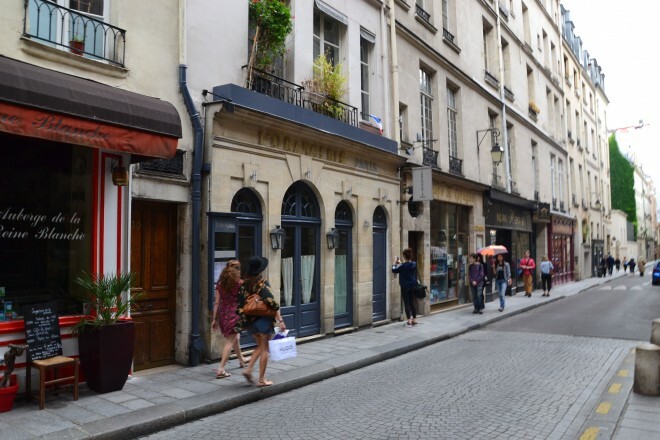 Quaint Parisian building facades with lovely balconies and charming storefronts filled with wine, cheese, pastries, and flowers, invite visitors of all kinds to take a stroll down this delightful street. Located along the Mississippi River Valley, Galena's charming Main Street is truly the economic and social heart of the community. 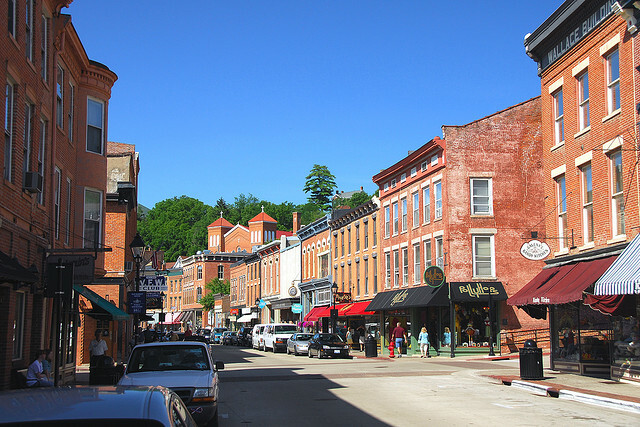 With its brick-clad buildings, quaint storefronts, and human-scaled signage, Galena’s Main Street is a great example of a classic American Main Street. 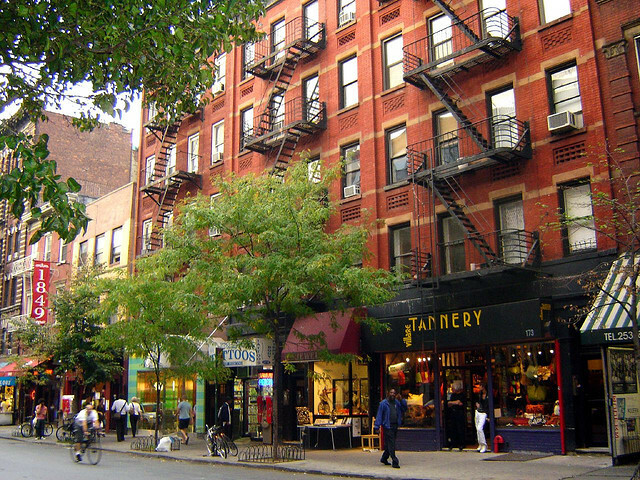 The West Village’s Bleecker Street is a wonderful spot for exploring and window shopping. The street's playful store window displays and small-scale buildings offer passersby a fun and ever-changing pedestrian experience. A vibrant commercial corridor with more than 200 restaurants, cafés, and boutiques, Buffalo's Elmwood Avenue lies at the heart of the neighborhood. To encourage an economic and cultural renaissance on this street, in 2005 the Elmwood Village Association urged for the widening of sidewalks along this avenue to prioritize pedestrians over cars. 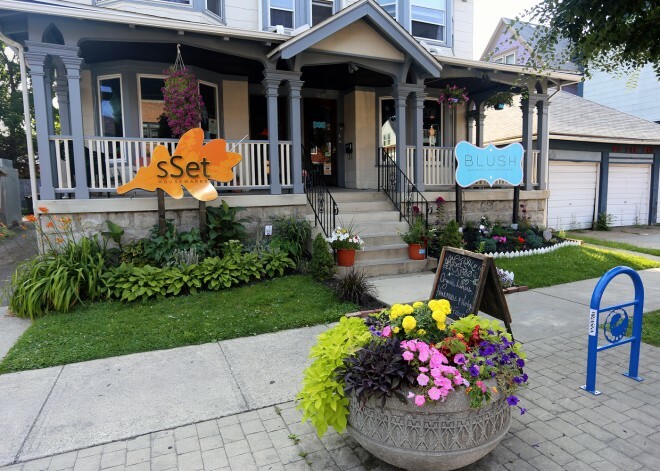 Because Elmwood Avenue's businesses rely on foot traffic, having great streetscape amenities and attractive ground floor facades has been key to its success. The avenue's human-scaled buildings and brightly-colored Victorian homes, along with its great shop windows, public art displays and murals, make this street an inviting and engaging commercial corridor. On East 12th Street between 4th Avenue and Broadway Avenue lies Strand Bookstore, a New York literary landmark. Numerous carts holding discount books line the sidewalk and invite passersby to become bookstore browsers. 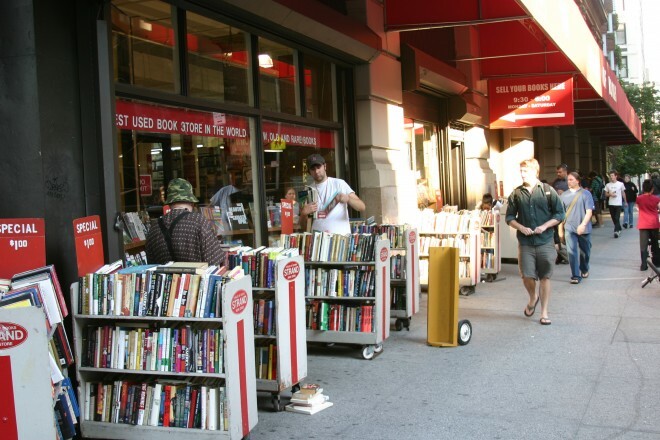 With these outdoor book bins, Strand Bookstore creates an inviting sidewalk environment that brings the store outdoors and encourages lingering on the sidewalk. 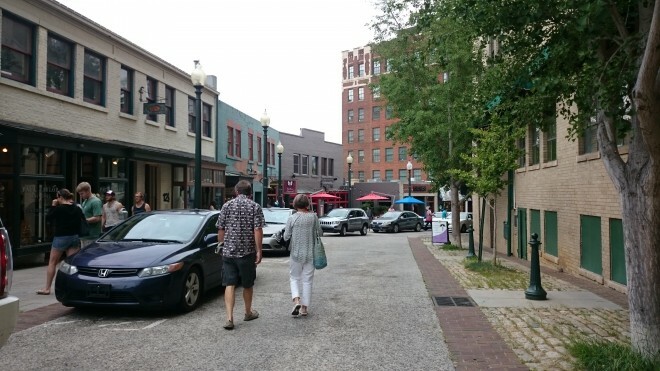 Formerly just an average Indianapolis suburb, the City of Carmel has become a national leader in attracting new businesses and residents by creating a beautiful, walkable downtown area that boasts numerous public spaces in which people can socialize and gather. The city's redevelopment strategy focused on creating an aesthetically appealing downtown by championing diverse building design and using high-quality materials. "The desire to go ‘through’ a place must be balanced with the desire to go ‘to’ a place." - UN-Habitat report, "Streets as Public Spaces and Drivers of Urban Prosperity"
Whether or not a street functions as a great public place is best measured by people’s willingness to linger along it. Of course, this metric of success is quite different from how transportation agencies and engineers might evaluate a street - through Level of Service metrics, for example, which calculate how quickly cars can pass through a corridor. Cities rarely measure the time people spend lingering on a street, despite its relevance to both social exchange and economic activity - such as shopping and dining out. One exception is the City of Melbourne, Australia, which documented in a 2004 report that after a decade of focusing on creating more public spaces and streets "with staying options" in the city center, there was a 98 percent increase in pedestrian traffic, and the number of people lingering in the area tripled! People spend more time in places where they feel comfortable, where there are features that capture their attention or interest, and where their basic needs are met - including having a place to sit if they’re tired, a place to grab a drink or bite to eat when they’re hungry, and a place to take refuge from the hot sun or pouring rain. Because of their sheer appeal and/or their adaptable design, great streets will have people on them in the freezing cold of winter or the dead heat of summer. 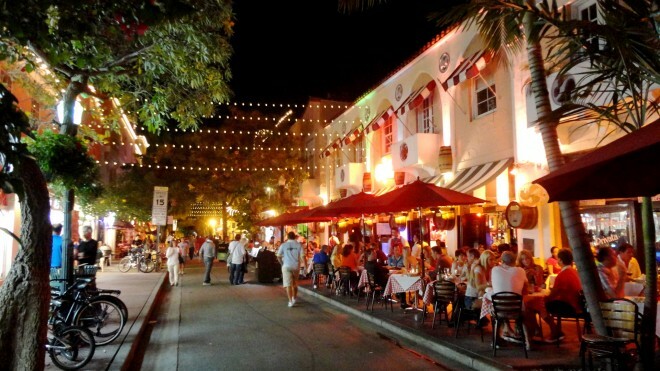 Española Way is a charming pedestrian street in South Beach that is typically packed with people, due to its outdoor cafés, street vendors, and frequent dancing events in the street. Its Spanish-style buildings, bright colors, and lights hanging overhead give it a romantic ambiance and a wonderfully inviting atmosphere. 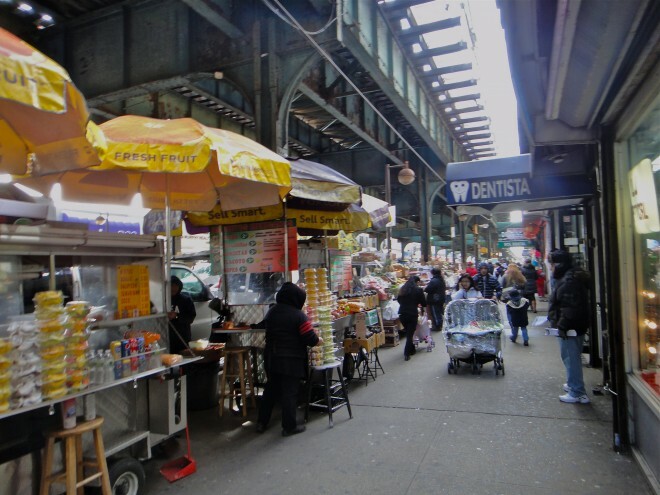 Located in New York’s most diverse borough, a combination of street vendors, a night market, and a plaza make visiting Roosevelt Avenue a unique cultural experience for locals and tourists alike. A new public space just off of 104th Street, Corona Plaza, has improved this street in recent years by offering a space for diners to sit and relax. 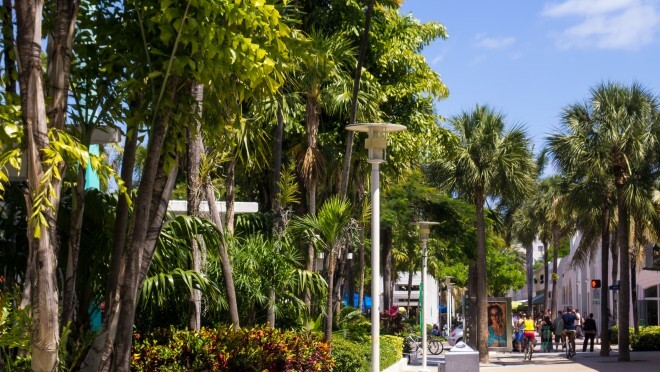 South Beach’s Lincoln Road Mall, a pedestrian street, is filled with outdoor cafés and shopping along with numerous fountains and ponds which attract hundreds of visitors daily. Unique landscaping and awnings provide shade from the hot Florida sun, inviting passersby to relax and linger. The colors and style used in its design, its palm trees and plants, and expansive indoor/outdoor restaurants all contribute to the area's unique local flavor. Hundreds of locals and tourists flock to Marine Drive’s pedestrian promenade everyday. Set against the beautiful backdrop of Mumbai’s skyline and the Arabian sea, Marine Drive is a great space for resting and relaxing. With a variety of street vending as well as seating amenities that are incorporated into the design of the space, this street is a pleasant place for a stroll and a welcoming public space for all. 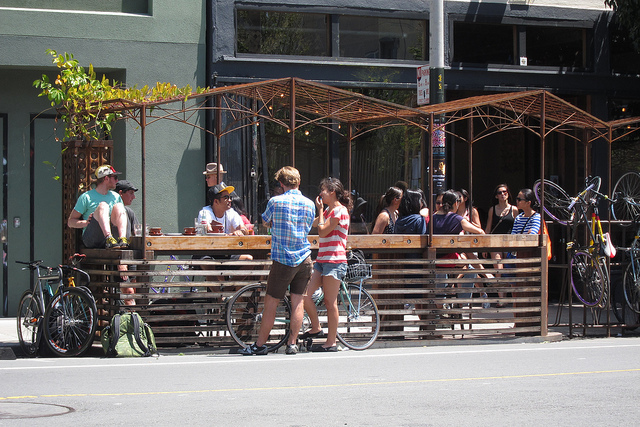 Boasting seven parklets - public spaces created by re-purposing parking spots - Valencia Street invites residents, business patrons, and tourists to linger in San Francisco’s Mission District. Each parklet is uniquely designed and has a distinctive feel. 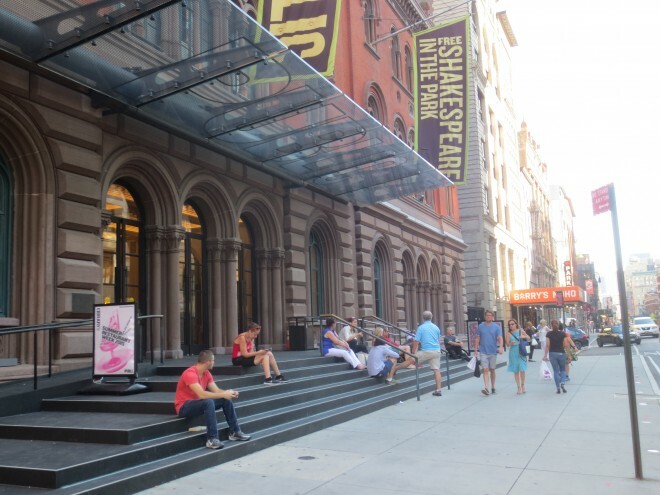 In 2009, the Public Theater redesigned its front entrance to include a grand stairway that would bring the Public Theater more into the public realm. In addition to the grand stairway, part of the redesign plan included a 10 foot wide bump-out sidewalk extension that removed one lane of traffic as well as the installation of several 7-foot-tall poster kiosks in front of the building. This grand stairway has already had a significant impact on the street's foot traffic, and it has become an inviting and hospitable public space for lingering on Lafayette Street. Throughout the day and evening, people of all ages and walks of life hang out on this staircase to relax, eat, or people watch. One of the most iconic streets in the world, Champs-Élysées is a beautiful tree-lined boulevard with lovely outdoor cafés and stores on both sides of the street. 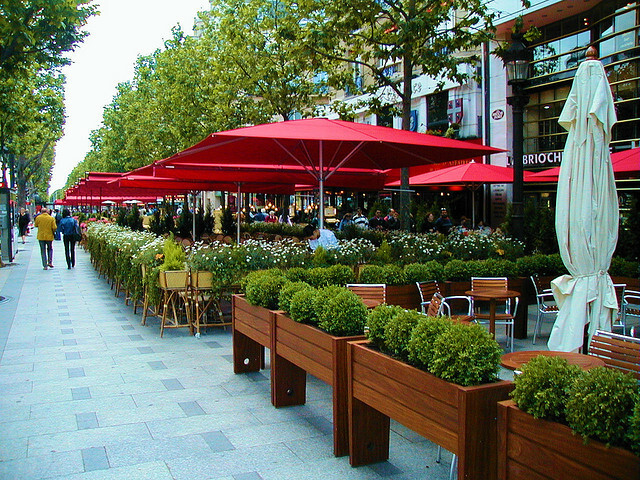 Despite being a wide street, with 10 lanes of moving cars, its wide sidewalks, active ground floors, and consistent buffer of trees makes it a great place to sit, enjoy a café au lait or glass of wine, and experience Parisian life. "The best streets encourage participation. People stop to talk or maybe they sit and watch… taking in what the street has to offer." - Allan Jacobs, "Great Streets"
What may differentiate Placemaking from other urban planning and design movements is its emphasis on spaces that facilitate interaction between people. Streets, more so than any other public space, have the potential to spark limitless interaction - planned and unplanned, long and short, between people of all ages and backgrounds. It’s what builds a sense of community and place attachment. As Jane Jacobs said, ‘The trust of a city street is formed over time from many, many little public sidewalk contacts. It grows out of people stopping by the bar for a beer, getting advice from the grocer and giving advice to the newsstand man…"
William Whyte used the term "triangulation" to refer to features and activities that create linkages between people in a public space. In his words, it is "a process by which some external stimulus provides a linkage between people and prompts strangers to talk to other strangers as if they knew each other." There are many ways a street can spark interaction between people, from amenities like public art, water features, and seating options, to entertainment like street performers or programming, to interesting shop and window displays. While markets and street vendors - who rely on regular exchange between buyers and sellers - have this kind of street interaction built into their daily practice, interactive streets are also places that encourage informal exchanges. In these places, people respond and interact in their own ways by listening to music, engaging a public sculpture, or reading historic signage that helps them understand the significance of a particular place. Great streets are a multi-sensory experience of sights, sounds, and smells, and often of taste and touch as well. Created through a street redesign that replaced an underutilized parking lane and a simple sidewalk with a 28,000 square foot plaza, the Porch is new public space adjacent to Philadelphia’s Amtrak station. With movable tables, chairs, and umbrellas and regular events, including mini golf, music performances, weekly farmers market, and cultural offerings, the Porch draws neighborhood workers, residents, students, and visitors. 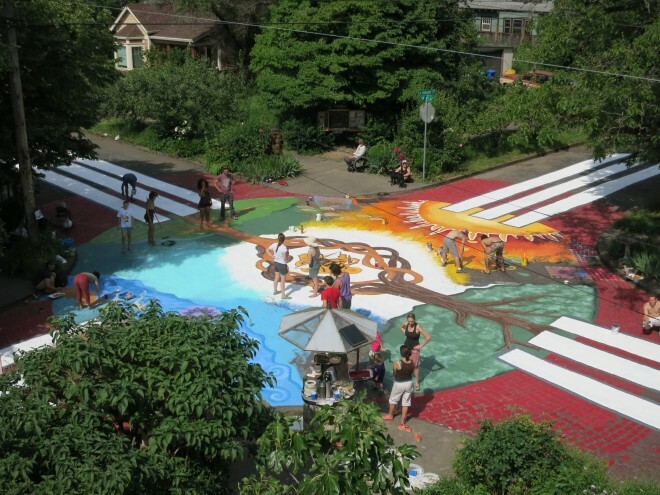 Residents of Portland’s Sellwood Neighborhood transformed a residential intersection into an interactive social gathering place for people. Each corner of this colorful intersection includes a unique amenity such as a community bulletin board, a little free library, a 24-hour tea stand, and an open air playhouse for children. Today, this intersection is a community-oriented space for both neighbors and visitors. Millennium Park’s Crown Fountain is part of an effort to create an interactive and inviting edge to draw people from Michigan Avenue into the park. Located in Millennium Park and adjacent to Michigan Avenue, Crown Fountain is an interactive public art and video sculpture. 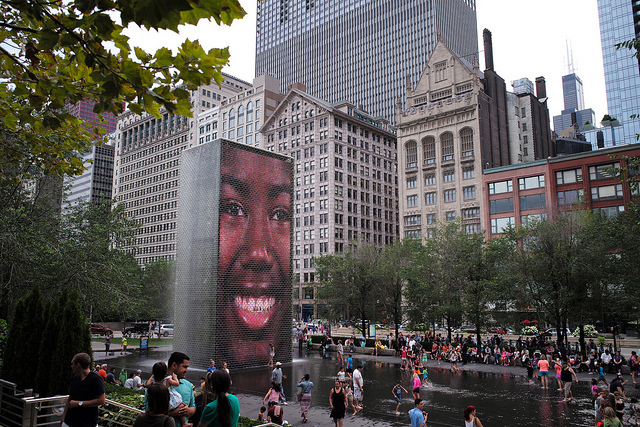 The fountain consists of two glass towers that project video images of faces of Chicago citizens that come alive when water flows out of the image’s mouths. This section of Michigan Avenue is a popular gathering spot and the fountain is a play area that allows adults and children to frolic in the water. 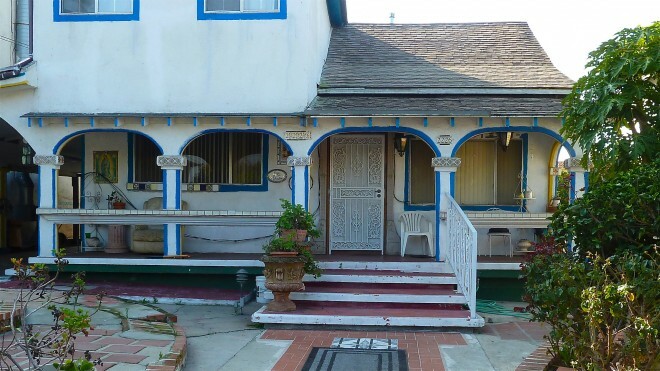 For Latinos residing in East Los Angeles, the front porch and yard of one’s house is a spatial asset that can serve as the center of community life. Incorporating features of the plazas and courtyards common in Mexico, some residents of East LA have transformed their front yards to include decorative plazas that provide places for social interaction among neighbors. Events that typically occur in the backyards of most residential neighborhoods, such as birthday parties and barbecues, are often hosted in front yards throughout East Los Angeles, sometimes spilling into the streets. These transformed front yards have become anchors of public space and social life in residential streets of East LA. ‍A front porch and plaza typical of East LA that enhances social interactions among neighbors | Photo courtesy of James Rojas. 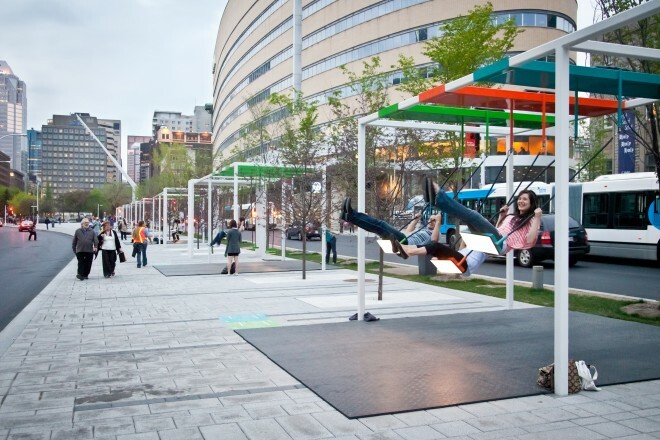 Since 2012, the City of Montreal has transformed a lackluster median into a colorful and active space by installing twenty one musical and multicolored swings. Social interaction and play are fostered by the unique design of the swings: When all of the swings are used simultaneously, they compose musical pieces in which certain melodies are available only through cooperation. The result is an area with instruments that encourages social interaction between people of all ages and backgrounds. 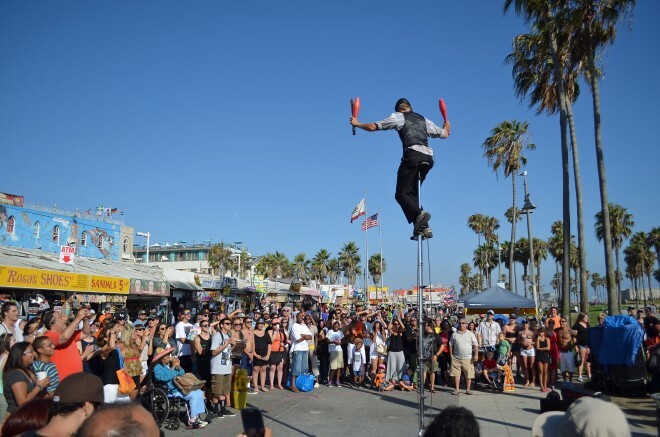 With a constant stream of street artists, performances, bodybuilders, and musicians, Venice Beach’s Ocean Front Walk offers a public stage for street performers and artists of all types. 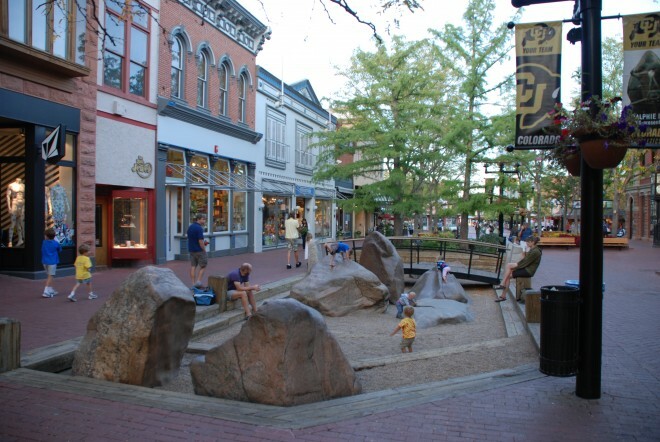 Play elements are an integral piece of Boulder’s Pearl Street Mall. Each block of the mall has large child-oriented amenities, such as whimsical statues, boulders for climbing, sand boxes, and a jet fountain. This child friendly environment fosters an inviting and playful atmosphere for all and encourages kids to make new friends and playmates. 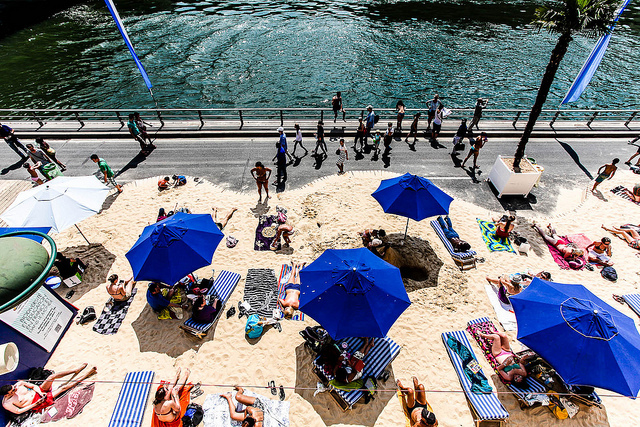 For one month each summer, cars are prohibited from driving on this expressway along the Seine and it becomes a pedestrian and beachside paradise filled with sand, palm trees, and beach chairs. The "Paris Plages" are home to a variety of play equipment for children and adults, street performers, and water activities. 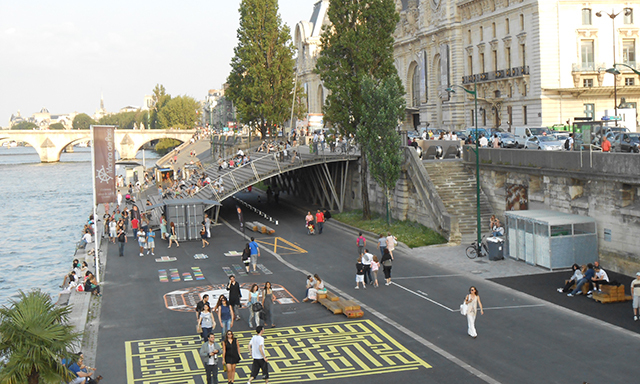 In 2013, the City of Paris transformed one of its busiest two-lane thoroughfares in the city, Voies sur Berges, into a 1.4 mile pedestrian promenade filled with play equipment for all ages. Now named Berges de Seine, this river promenade is packed with recreational activity and playful amenities such as a climbing wall, ping pong tables, sprinting track, chalk wall, public stage, teepees, and games painted on the street. Named after former resident and renowned Dutch Impressionist, Vincent Van Gogh, Van Gogh Walk is a shared space street in London that has received numerous planning and Placemaking awards for its design and Van Gogh-inspired amenities. With gardens, seating on raised planters that are engraved with quotes from Van Gogh's letters, a mini library, a basketball hoop, and play structures including climbing posts and numbered stepping stones, Van Gogh Walk encourages physical and social activity, while also promoting a sense of community in this dense urban neighborhood. The best streets in the world do not look or feel like any other street; they have an identity of their own and unique features, whether it’s a winding lane in Little Italy or a grand boulevard like the Champs-Élysées. Planner and author Victor Dover talks about the importance of "memorable streets," where your experience there makes a lasting imprint. Architect Ben Hamilton-Baillie agrees that great streets often have "an unexpected feature or quality to them.’’ Too many streets in our communities have the opposite effect - the same pavement, lighting, road signage, parking lots, and chain stores which lead to our streets having a placeless, "Anywhere, USA" feel, where no one wants to linger. Streets have a tremendous capacity to communicate to us a place's history, culture, values, and assets. In Public Streets for Public Use, Mark Francis theorizes that "A democratic street is one that reflects the history as well as the social and economic diversity of the larger neighborhood and city." The issue is that people and cities rarely tap into that potential; instead of performing like a well-coordinated orchestra, street design is too often the result of a bunch of city agencies and individual property owners each playing their own instrument, out of sync and out of time, making no concerted effort to harmonize with each other. Fundamentally, it’s up to local communities to figure out what story they want their streets to tell. 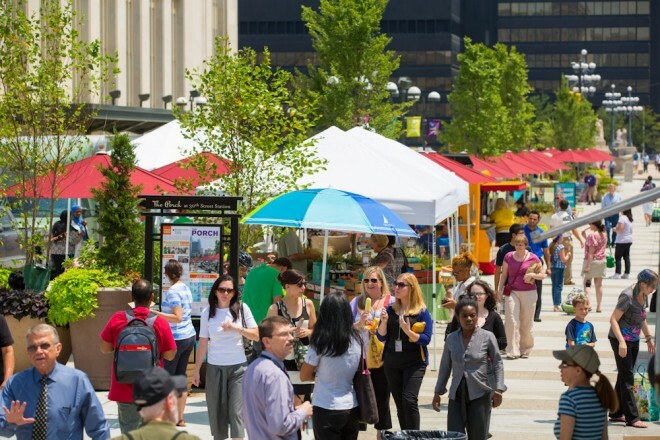 There are a multitude of ways to showcase a community's identity, history, or local assets, whether through building design, public art, landscaping, pavement materials and design, wayfinding or other signage, programming or special events, and the showcasing of local institutions, people, and businesses on the street. Celebrating 100 years in 2015, the Italian Market on 9th Street in South Philadelphia is the nation’s oldest continuously operating outdoor market. Ten blocks are filled with dozens of food vendors, specialty food shops, restaurants, and grocers peddling all kinds of vegetables, meats, and cheeses. Although the Italian Market still holds on to its strong Italian heritage, a new surge of international flavors, such as Mexican, Korean, and Vietnamese, have arrived on 9th Street, thus reflecting the diverse cultures that make up modern day Philly. University Avenue is home to St. Paul’s Asian business and cultural district, Little Mekong. Lined with a variety of stores and top-rated Asian restaurants, University Avenue is also home to the Little MeKong Night Market, an open street market with food vendors, crafts, music, and cultural performances that pays homage to the night markets found throughout Asia. On this stretch of University Avenue, residents and visitors can share and experience the culture and flavors of Minnesota’s Southeast Asian community. Insadong-Gil pays homage to Seoul’s cultural history through the materials used and programming that happens along this shared street. 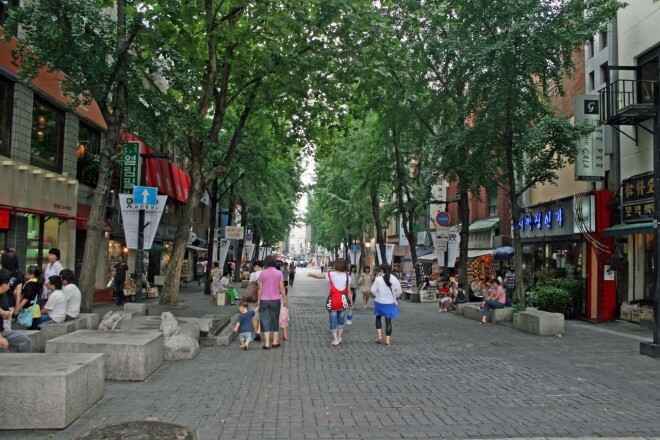 Street furnishings are engraved with historic tales, while traditional Korean black tiles pave the street. Special events such as calligraphy demonstrations and pansori dance performances further highlight Korean culture on this historic street. 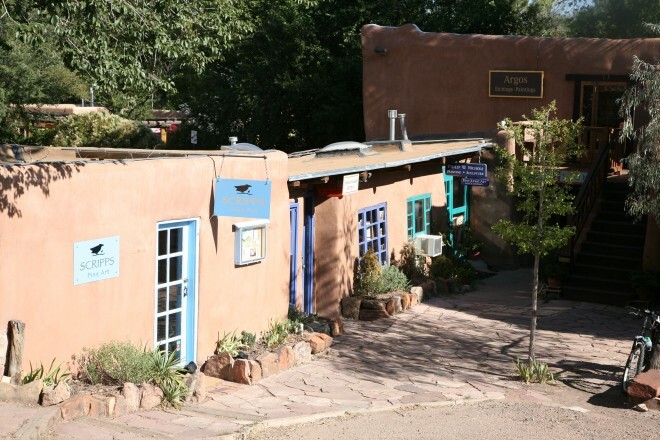 Historic charm and a unique sense of place attract 1.5 million visitors each year to Canyon Road, a quaint Santa Fe street with a vibrant arts scene and many beautiful Southwest style buildings. The street features native landscaping, public art made by local artists, and art studios focused on Native American and Spanish art. Nicknamed the “Magnificent Mile,” Michigan Avenue is a great street for walking and exploring several key geographic, architectural, and cultural landmarks in Chicago. 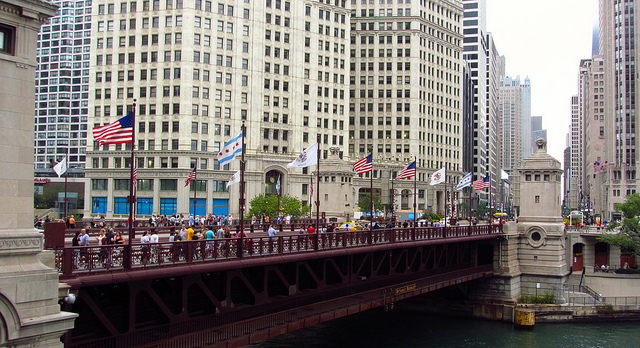 Walking on this street, pedestrians will pass the shores of Lake Michigan, the Chicago River, the DuSable Bridge, and historic skyscrapers such as Chicago Water Tower, the Art Institute of Chicago, and Millennium Park. Wide sidewalks along the length of this street make it wonderful place for viewing many of Chicago's major sights. 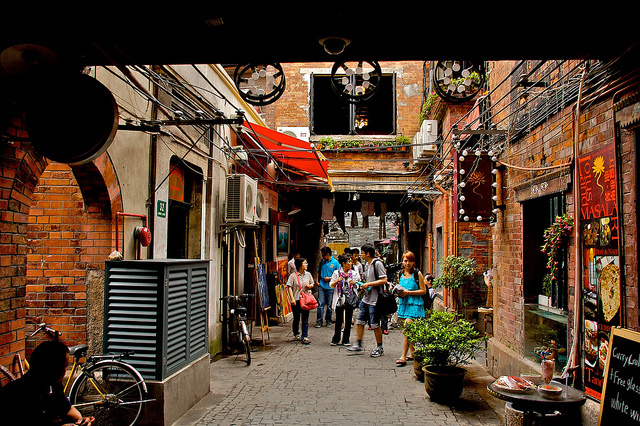 In the Tianzifang neighborhood of Shanghai, a labyrinth of alleyways makes up the city's most prominent artist enclave. Craftsmen, designers, and artists live and work in this historic neighborhood, which is filled with original Chinese-style Shikumen buildings and French colonial buildings. Locals and tourists fill these alleys to see its historic architecture along with the art studios, galleries, craft stores, coffee shops, and restaurants that surround them. 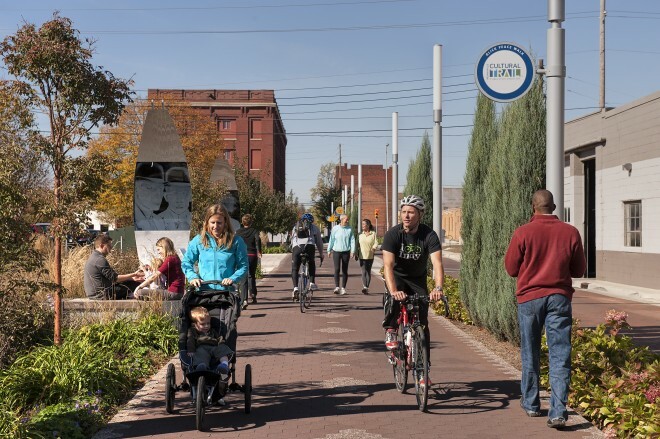 Downtown Indianapolis has been recently transformed by an eight-mile bicycle and pedestrian path that connects five of the city's cultural districts and neighborhoods. The trail passes nearly every major cultural and entertainment venue downtown, including the Indiana State Museum, the Indiana Repertory Theater, and Fountain Square. The unique design elements of the trail include distinctive pavement materials, wayfinding signs, and public art by local artists. ‍Photo courtesy of Indianapolis Cultural Trail, Inc. 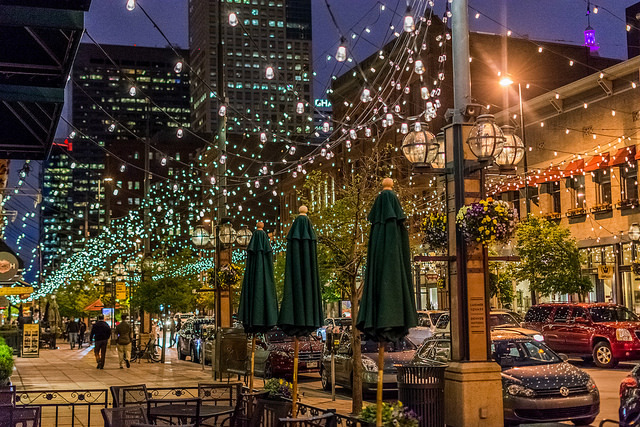 Located in the city's oldest neighborhood, Minneapolis' Main Street features historic buildings, original cobblestone paving, and some of the oldest institutions and businesses in Minneapolis. 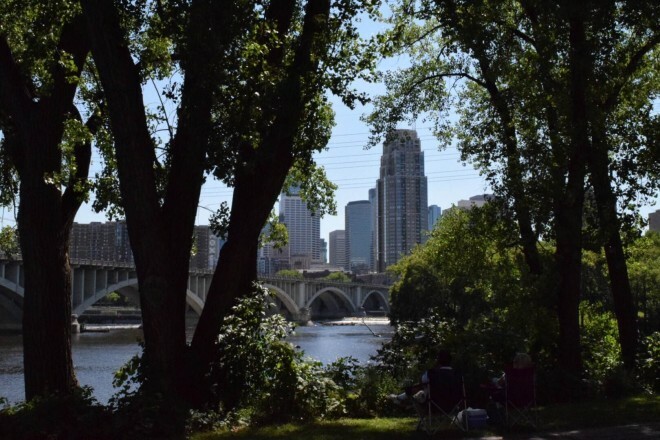 With views of the Minneapolis skyline, the Mississippi River, and Saint Anthony Falls, this street and its adjacent green spaces highlight the river’s central role in the development of the city. Main Street also hosts several annual festivals, such as the Twin Cities Polish Festival, which pay tribute to the neighborhood's Eastern European roots. Moreover, wayfinding along this street directs visitors to area attractions such as the Stone Arch Bridge, Nicollet Island, as well as Northeast and Downtown Minneapolis. 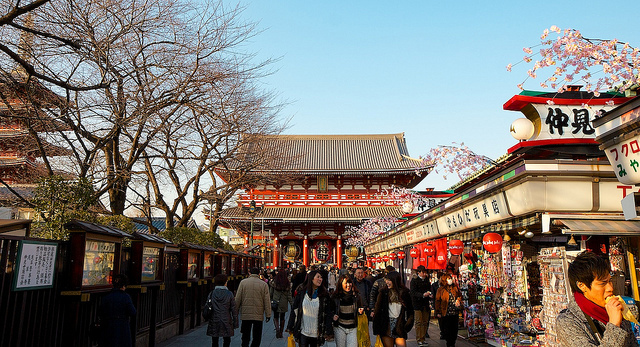 This historic shopping street near Tokyo is characterized by its traditional architecture and proximity to the famous Senso-ji Temple. Merchant stores displaying colorful Japanese goods and artwork are on display even when the stalls are closed, due to artwork on the store’s shutters. Austin, Texas has been dubbed the live music capital of the world and Sixth Street is the heart of Austin’s live music scene. 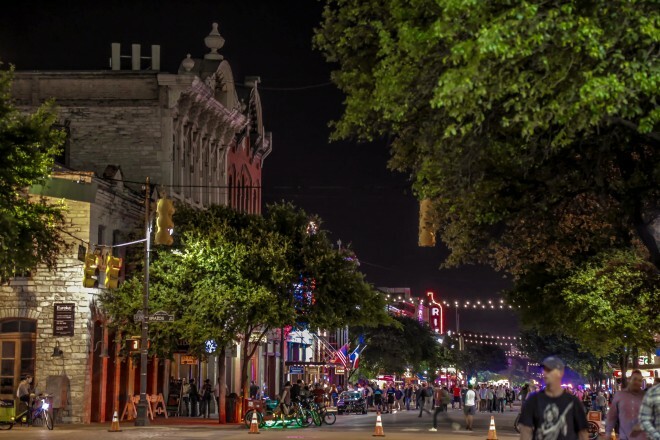 Arguably the most famous street in Texas, Sixth Street is Austin’s entertainment showpiece. Numerous live entertainment venues, bars, and art galleries are housed in historic buildings along this street, making it the place to be during Austin's annual South by Southwest Music festival. Great streets are true meeting grounds of local society - where people of different ages, ethnicities, and income levels intersect and interact. To make that happen, not only does a street need to have diverse destinations and activities, but it also needs to be easily accessible to all. When a street can be easily accessed by walking, biking, and transit, it attracts a wider variety of people to it than if it is only within reach of those with a car. And when a street is designed to be amenable to everyone, including those with special needs - like wheelchair or stroller accessibility, for example - it becomes a place that welcomes and prioritizes vulnerable populations in our communities. Streets that function as places prioritize the pedestrian. People lingering and walking along a street make it a more vital and vibrant place in a way that greater numbers of cars do not. At the network level, pedestrian-friendly streets often have shorter block lengths, which Jane Jacobs and others have found to facilitate more encounters and interactions among people. Frequent intersections also create better access and egress points to the street, which helps facilitate the additional mixing of people who are coming from other streets. 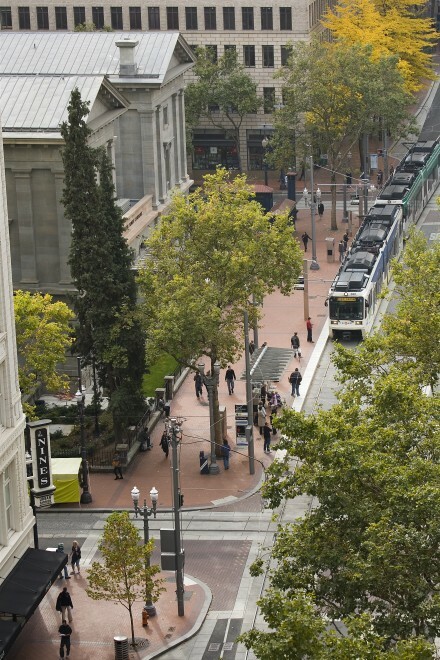 Spanning 57 blocks, the Portland Transit mall is a couplet of one-way streets in downtown Portland that includes bus and light rail service. Serving more than 600,000 transit users on the average work day, the Portland Transit mall is a pedestrian and transit oriented corridor that features wide sidewalks for pedestrians, designated bicycle lanes, bicycle parking, and more than 40 public art pieces along its span. ‍October 20, 2009- Portland, OR- TriMet's MAX Green Line Light Rail Project. 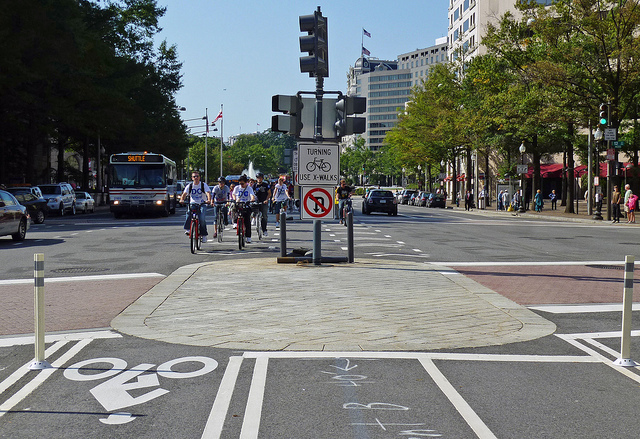 In 2010, two-way protected bike lanes were opened in the median of the famous Pennsylvania Avenue running from Third Street NW to Fifteenth Street NW. In addition to the new cycle track, street improvements have also included the addition of pedestrian refuge islands to facilitate safer street crossing. George Street is a great example of a busy street that prioritizes pedestrians, despite being a important roadway for vehicles, too. With low vehicular speeds, sidewalks that range from about 13 feet to 27 feet wide, pedestrian-scaled lighting, well-marked crosswalks, bike parking, bus stops and several benches, George Street provides pedestrians with a safe and convenient way to experience this major retail corridor. Frequent opportunities to cross the street on marked crosswalks create a strong pedestrian presence on the street. 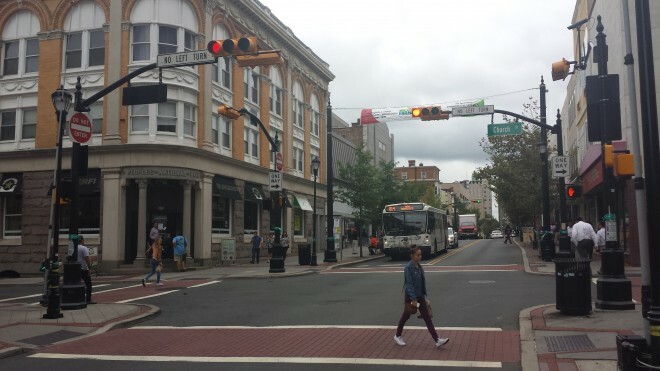 Additionally, a variety of stores and restaurants on George Street serves the needs of the New Brunswick residents, downtown workers, and Rutgers students and faculty who frequent this street. 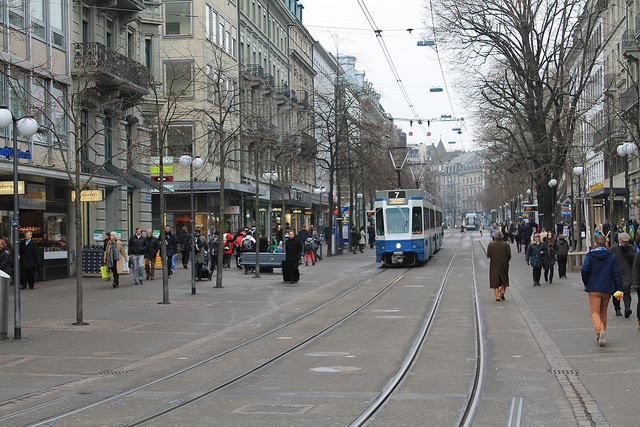 In addition to being Zurich’s most famous retail destination, Bahnhofstrasse is also an important transit corridor. As a shared space street, pedestrians can move freely across the road, with the street and sidewalk at grade for its entire length. 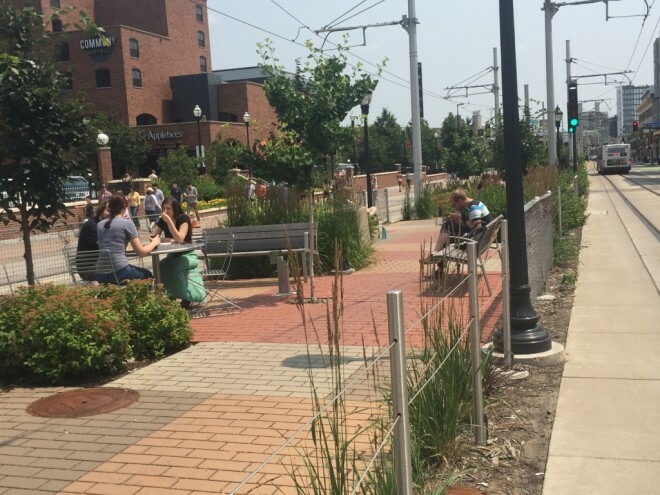 Moreover, this street is designed for all modes of transportation: automobiles are able to cross the street and park along it, and bicyclists share the street with light rail. Washington Avenue, a new transit/pedestrian mall, lies in the heart of the University of Minnesota-Twin Cities campus. With about 50,000 students on campus, this street is heavily trafficked by pedestrians, bicyclists, light rail riders, and bus users. The newly-designed pedestrian mall includes bicycle lanes, six bike boxes to make turning left from bike lanes easy, bicycle traffic signals, and a landscaped median with café tables and benches to encourage lingering. Located in the Union Square Shopping District, Powell Street is one of San Francisco’s busiest thoroughfares. The two block Powell Street Promenade changed this busy street from a corridor that people passed through into a destination for pedestrians in the heart of the city. 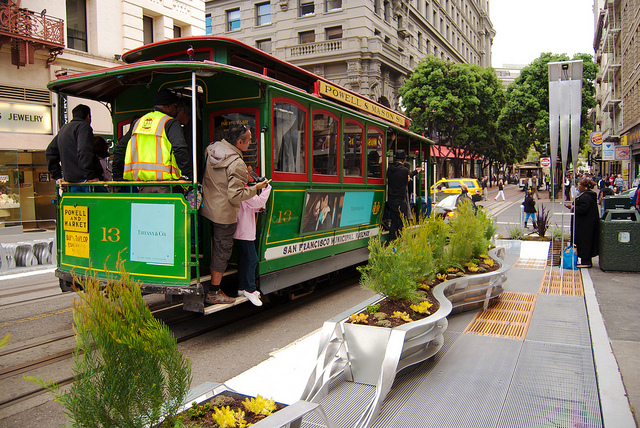 Without compromising the historic San Francisco Cable Car line and vehicular traffic, the Promenade provides pedestrian activity space and includes eight parklets with street furnishings. 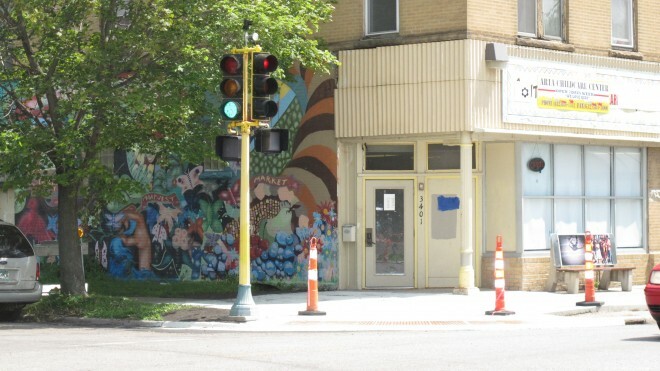 Artists transformed bus stops along Chicago Avenue into “Art Stops” in Minneapolis. These Art Stops create a sense of neighborhood and connect transit users together through art. Intended to remind Metro Transit commuters of the diversity and history that exists near these bus stops, each Art Stop piece holds a message of the neighborhood's culture and community building. 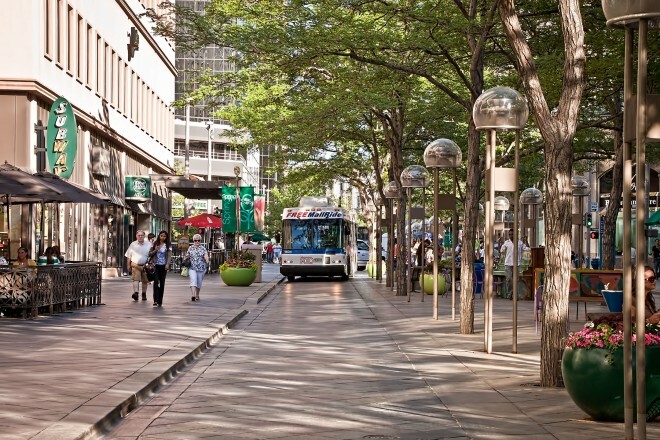 Denver’s 16th Street Mall is a long tree-lined, pedestrian promenade and an important transit corridor that connects Union Station to the Colorado State capitol. Wide sidewalks and free shuttle buses run along the course of this 1.25 mile long street, which is lined with hundreds of stores, restaurants, and cafés. The needs of the neighborhoods adjacent to our streets can change over time, and often even over the course of a week. A downtown street may be flooded with cars during the week, but home to more pedestrians than vehicles on the weekends. Similarly, great streets need to work year round, even in challenging weather conditions. For most streets in our communities, however, the layout and use of our streets remains static. We’re often not getting the best use out of our streets. Streets have enormous capacity to be flexible spaces that can meet multiple community goals, especially when they are designed with that purpose in mind. Lacking adequate civic space for special events, some communities have started to create flexible streets that can more easily be used for markets, shows, Play Streets, and local celebrations - often signified by special concrete paving or stamping on the street, as well as streetscape amenities and signage. Lighter, Quicker, Cheaper methods and materials can help to maximize a street's flexibility, making it easier to facilitate short term or regularly scheduled changes on a street. 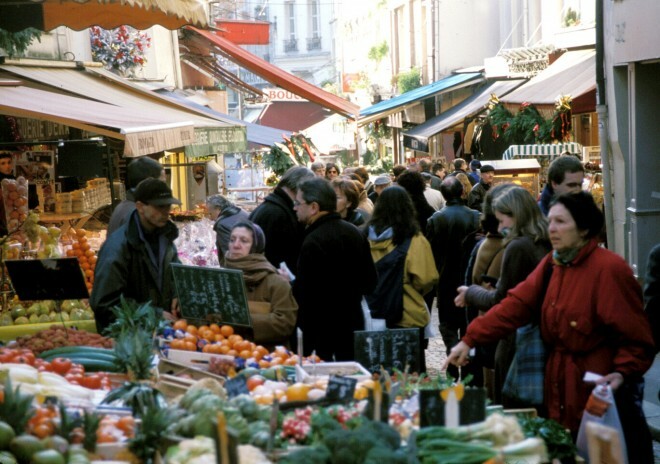 Rue Mouffetard’s lively outdoor market fills this narrow pedestrian street every morning as Parisians come to do their daily shopping. 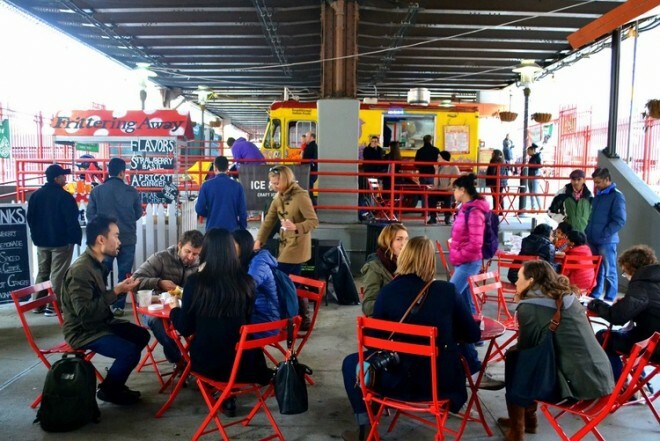 After the market closes, restaurants and sidewalk cafés open up. Store awnings provide shade for both market displays and outdoor diners, while the mostly at-grade cobblestone allows for the flexible placement of seating and tables on the street. 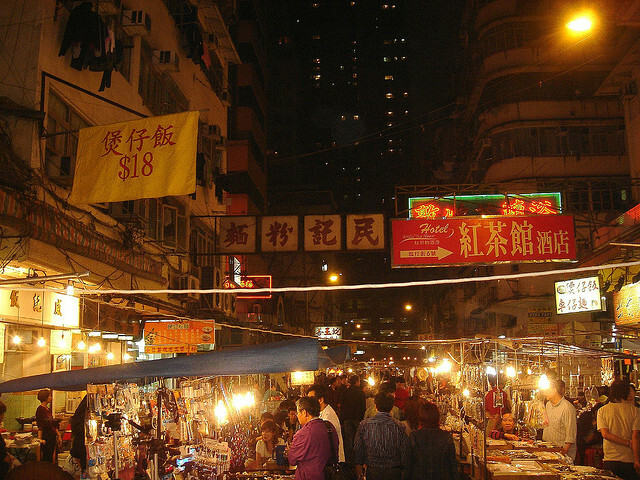 Hong Kong's Temple Street transforms every evening into a lively night market with hundreds of vendors selling delicious foods, fashionable clothes, and locally made crafts. Starting at 2pm, Temple Street is closed to vehicular traffic and vendors begin setting up their stalls in anticipation of the hundreds of locals and tourists who swarm to this bustling Night Market. 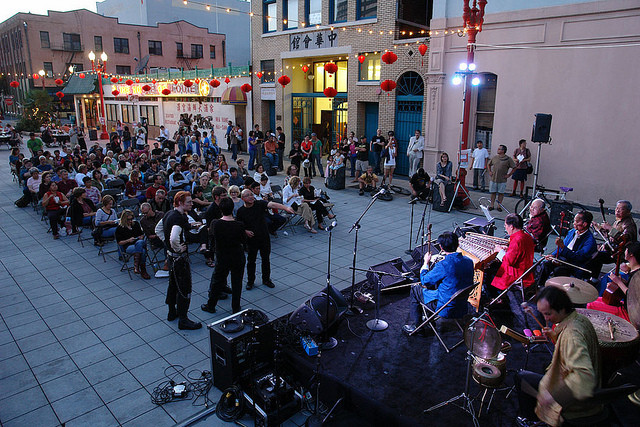 Located in Portland's Chinatown, NW Davis Festival Street is a flexible public space similar to a piazza in Latin America or Europe. It is curbless to maximize flexibility. Instead of curbs, granite bollards create the distinction between the roadway and sidewalk. Its unique traffic calming techniques and streetscape features result in a street that can easily be converted for public use on weekends or special events. Washington DC’s 7th Street is home to the historic Eastern Market, an important neighborhood anchor. An indoor market during the week, on Saturdays and Sundays the street is closed to vehicles so that the market can expand and use the full right-of-way. 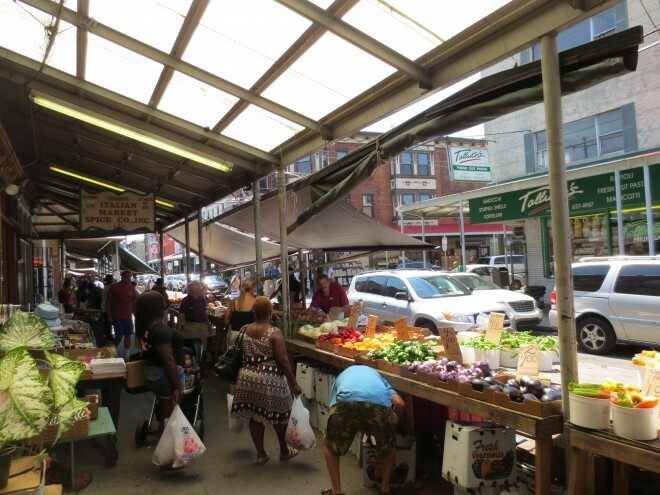 A large canopy on the Market Building’s exterior offers shade and rain cover for pedestrians and street vendors. Special pavement across the right-of-way in historic stamp style adds to the charm of this street and serves as a signal to drivers to lower their speeds. Additionally, the street is closed to vehicular traffic for special events throughout the year. The redesign of Brighton’s New Road transformed this car-dominated and unattractive street into a shared space where pedestrians, bicyclists, and cars coexist. 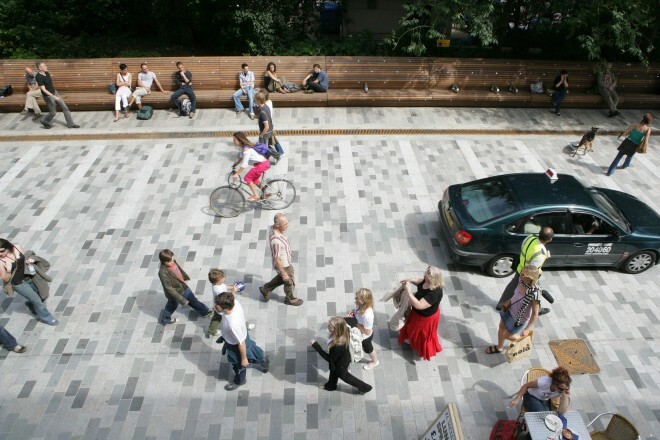 No longer divided into separate spaces for walking, cycling, driving, and parking, the street now responds more directly to the people using it and has become a space where people can gather, sit, and relax. The amount of space available for pedestrians has increased significantly, as indicated by the street's curbless design with special pavement design across the right-of-way. The team that created the street's redesign included wayfinding measures for the visually impaired throughout – a tactile guidance strip along one side of the street; a contrasting strip along the other; and textured paving areas to mark thresholds, potential hazards, and movement onto the shared surface. 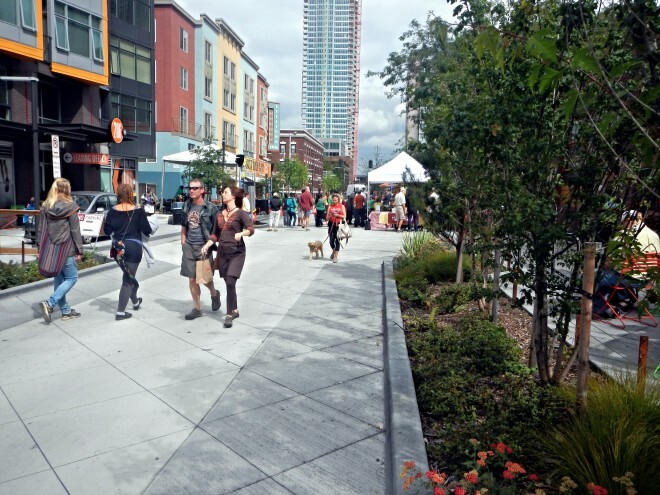 In 2014, Seattle developed its first shared street. Formerly an underutilized roadway, Bell Street’s new design allows this shared space to host a hybrid of park activities and street functions. With its curbless and continuous surface materials, Bell Street Park encourages pedestrians, cyclists, and automobiles to share this four block space. Intersection cues force vehicles to rise onto Bell Street through a driveway entrance, promoting slow driving speeds. Sidewalks were widened to create sidewalk café zones, adding to the liveliness of this street. Activities and events, including outdoor movies, markets, and live music further the park spirit of this street.